(CBS News) In the NIT semifinals on Tuesday night, Stanford squared off against UMass in a tightly contested game at Madison Square Garden. But the real excitement came in the locker room before the game. 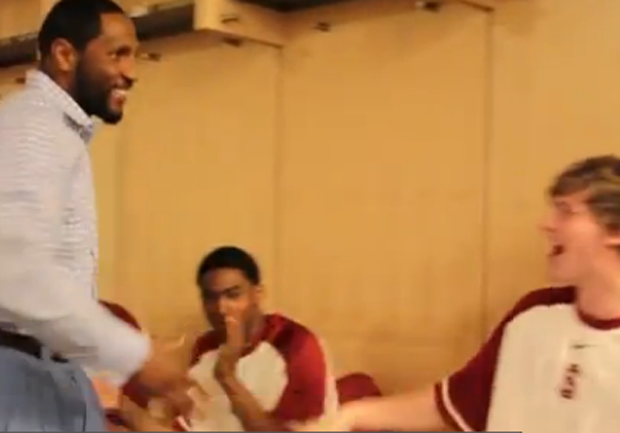 Prior to tipoff, Ravens star linebacker Ray Lewis paid a surprise visit to the Cardinal team to deliver a motivational speech to players. "Wins and losses come a dime a dozen but effort?" Lewis says. "Nobody can judge effort. Because effort is between you and you." He later got more animated: "I'm pissed off for greatness. Because if you ain't pissed off for greatness, that means you're OK with being mediocre." The message worked. Stanford upset a much taller UMass squad 74-64, then went on to crush Minnesota 75-51 last night in the championship game. Said Stanford coach Johnny Dawkins after the semifinal victory: "On a night when we didn't shoot well, we found a way to win." We're guessing Lewis helped them find the way.